Raymond John Wrycha, 88, passed away peacefully after a long illness on Tuesday, January 29, 2019, at Pride TLC of Weston, where he had been in hospice care through Ascension Hospice Services. Until he recently moved to Pride on January 24, 2019, Ray had been a resident at Atrium Post Acute Care in Weston since June 1, 2016. Ray’s family is eager to express their gratitude to the whole staff at Atrium for the excellent, compassionate care that Ray received there over the last three years and to thank Pride and Ascension Hospice for the care Ray received in his last days. Born in Galloway, Wisconsin, on July 28, 1930, Ray was one of ten children of Felix and Gertrude (Wierzba) Wrycza. 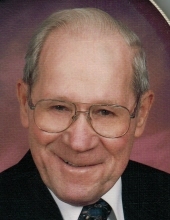 He graduated from Wausau Senior High School in 1949. While in High School, Ray worked for the Elks Club waiting tables and, in the days before automation, resetting bowling pins by hand. In High School, he also worked at the Swedish Bakery and, one summer, won a contest and had his picture in the paper as the fastest bean picker in Marathon County!Ray married Virginia Jablonski in 1950 at St. Paul Catholic Church in Mosinee. Together, they had four children, Raymond Jr., James, Sandra and David. Virginia died in 1966. In 1974, Ray married Mary Helen (Tominac) Froeba, at St. Therese Catholic Church in Rothschild, whose first husband died in 1970. Ray became a father to her three children as well, Lori Ann Froeba, Mark Froeba and Paul, whom Ray legally adopted.After High School, Ray worked for Nesbitt Bottling Company. In time, Ray began working for Standard Oil (later Amoco), eventually becoming a highly successful, award-winning Amoco Agent. When Amoco required all of its Agents to become Jobbers in 1976, Ray founded Wrycha Oil, Inc.. Unfortunately, the Oil Shock of 1979 and other business pressures ultimately forced the business to close its doors. Thereafter, Ray worked for Pennzoil until he retired in 1995. Even after he retired, he continued to work part-time for Wisconsin Lift Truck until his second (final) retirement in 2005.Ray was a parishioner at St. Therese Catholic Church for the whole of his adult life. At St. Therese, he became an usher early on and would eventually be the parish’s Head Usher for over fifty years. As a boy, Ray learned to serve the Latin Mass and could still recite the responses in Latin decades later. Ray and two of his sons served as cross and candle bearers for the Living Stations at St. Therese. Ray was also one of the first two parishioners (the other was Evelyn Staszak) selected to serve as Extraordinary Ministers of the Eucharist at St. Therese. In his retirement, Ray resumed serving Mass, first at funerals and later at daily Mass, with his wife, Mary Helen. Ray and Mary Helen also served as sacristans at St. Therese for many years and they were part of a rotation of volunteers who led the Rosary before Mass on Sundays. In 1979, Ray was elected President of the Wausau Newman Catholic School Board where he had already served for three years as a lay representative of his parish. In their retirement, Ray and Mary Helen also served as “FOCCUS Facilitators” for 36 young couples who received their marriage preparation through St. Therese parish. Finally, Ray was a Charter Member of the Sacred Heart Council, #4628, of the Knights of Columbus at St. Therese and was a Third Degree member of the Knights for more than 60 years.In addition to volunteer work at his parish, Ray was very active in public service. He was Secretary and, later, Chairman of the Weston Police and Fire Commission. In 1988, he was elected to a two-year term to be a Supervisor for the Town of Weston. For many years, Ray served as a member of the Marathon County Selective Service Board. Ray was also a Vice-Chairman of the Marathon County Chapter of the March of Dimes and a member of the Board of Directors of the South Area Business Association.In many ways, work was Ray’s favorite hobby. He rose early every morning and was literally never idle for a moment of his day. Ray kept his house, his yard and his car well maintained and carefully groomed and he made sure his family knew how to do the same. He took particular pride in his lawn. Raking the yard every spring and fall became an annual family tradition. He especially loved to plan big work projects for three-day holiday weekends. In his retirement, Ray found a whole new outlet for his energy, his one-and-half-acre vegetable garden. Over the years, he grew just about everything you can grow in a vegetable garden in Wisconsin, corn, pumpkins, lettuce, beans, squash, tomatoes, peas, carrots, potatoes, gourds, beets, cucumbers and lots and lots of zucchini, all of which he was delighted to give away to family and friends. Ray had a life-long passion for Polka music. As a young man, this passion inspired him to learn to play the concertina. Ray loved to dance to Polka music. As a businessman, Ray sponsored Sunday Polka broadcasts on radio and TV. When Fr. Frank Perkovich brought his “Polka Mass” to St. Therese parish in the 1970s, Ray took the whole family to attend. The Offertory Hymn Fr. Perkovich wrote for the Polka Mass (“At this Sacrifice”) is set to one of Ray’s favorite Polka tunes (“Blue Eyes Crying in the Rain”). As it became harder to hear Polka music on radio and TV, Ray especially loved listening to the Polka Jamboree every Sunday on the radio (from 6:00 AM until noon!). Even as his health problems worsened in recent years, playing Polka music could capture his attention like nothing else. Ray is survived by his wife of 44 years, Mary Helen, his children, Raymond Jr. (Patricia) of Rhinelander, James (Jacquelyn) of Snohomish, Washington, Sandra (Timothy) Kipp of Shorewood, David (Gloria) of Sobieski and Paul (Tracy) of Madison, his step-children Lori Ann (Paul) Grzelak of Bourbonnais, Illinois and Mark Froeba of New York, New York, his sisters Clara Literski of Weston and Eleanor Grywacz of Stevens Point, his twelve grandchildren, his twenty-one great grandchildren and his many nieces and nephews. Those who preceded him in death include his parents, Felix and Gertrude, his first wife, Virginia, his brothers (and sisters-in law), Frank, Joseph (Marlene) and Stanley (Viola), his sisters (and brothers-in-law), Genevieve Wrycza, Theresa (Edward) Skierka, Laura (Leo) Breske, and Delores (Ronald) Boerner and his brothers-in-law Herman Literski and Donald Grywacz.Ray was a devoted husband and father, a faithful parishioner, a fair boss, a diligent employee and an honest public servant. He was also a kind, gentle person. When you were his friend, he was loyal for life! He had a good sense of humor and loved to laugh at a good joke and to get others to laugh as well. Ray was also, quietly, a very generous man. His family is still hearing new stories of his generosity from years past, for example, how in one case he filled up a family’s empty fuel-oil tank in the middle of winter even though they had no money to pay for the fuel and how he even helped them buy a new furnace a few weeks later after it broke down completely and then let them pay him back for the fuel and furnace slowly over time as they could afford to pay. His wife, Mary Helen, thanks him especially for his enduring love and for making her life over the 44 years of their marriage happy and secure. Services will be held at St. Therese Catholic Church in Rothschild on Friday, February 8, 2019 with visitation from 9:30 AM until the Holy Mass at 11:00 AM. Recitation of the Rosary will precede Mass. Burial will follow at Gate of Heaven Cemetery. John J. Buettgen Funeral Home is assisting the family at this time. Online condolences can be expressed at www.HonorOne.com. To send flowers or a remembrance gift to the family of Raymond J Wrycha, please visit our Tribute Store. "Email Address" would like to share the life celebration of Raymond J Wrycha. Click on the "link" to go to share a favorite memory or leave a condolence message for the family.